Montepulciano is an ancient village in the Tuscan wine region of Italy, that sits high up on a hill above a rolling landscape covered with vineyards. Walking through the large gate in the town walls is like stepping back in time. Narrow cobblestone streets wind through the town’s piazzas, and pass stone churches and towers that look much the same as they did during the Renaissance. Montepulciano is famous for its Vino Nobile di Montepulciano, a dry red wine made from the Sangiovese grape. Wine shops, or enotecas in Italian, are everywhere. The town is also known for its old wine cellars. Caves hollowed out by the Etruscans are still used to store massive oak casks that hold wine for aging. We had just finished a tour of the Talosa wine cellar and were ready to taste some wine. At the highest point of the town sits a large medieval fortress. The fortress was built in 1261 to defend the town from invaders during the wars between Florence and Siena. 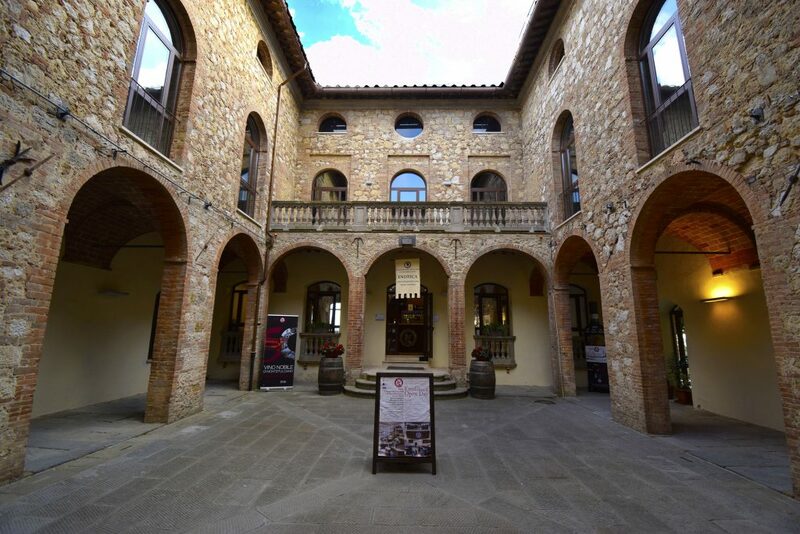 Today, it’s the main cultural center of Montepulciano and hosts a variety of art and craft exhibits throughout the year. 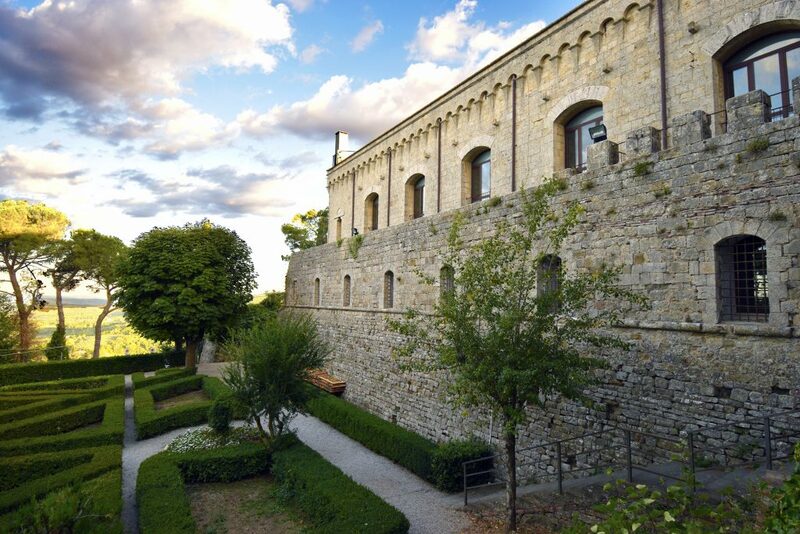 It’s also the home of the Consorzio Del Vino Nobile Di Montepulciano, a fascinating enoteca that specializes in wine produced in the Montepulciano wine region. 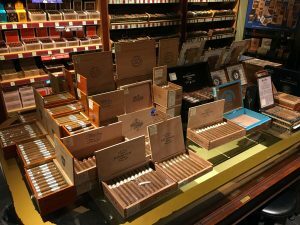 When we entered the shop, we were a little surprised with how bright and modern it is. It’s a nice contrast to the ancient exterior of the fortress. Behind the front desk is the wine tasting room. It was built over an archaeological excavation of the fortress and has glass floors so you can see the original structure. You’re literally tasting wine over a foundation that was built more than 700 years ago. 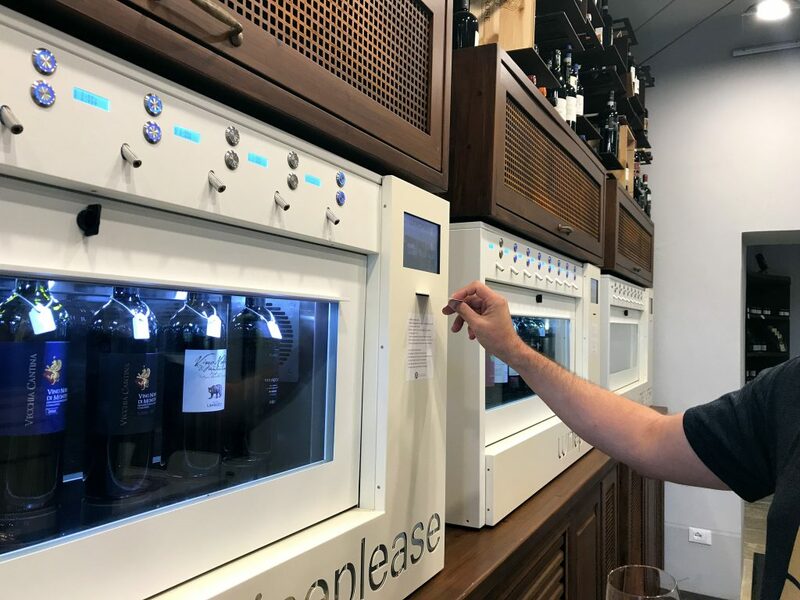 The shop has a self-service wine tasting system. When you enter the shop, pick up a card at the front desk. The card will keep track of each glass of wine you taste. Before you leave, return the card to the desk and pay the bill. 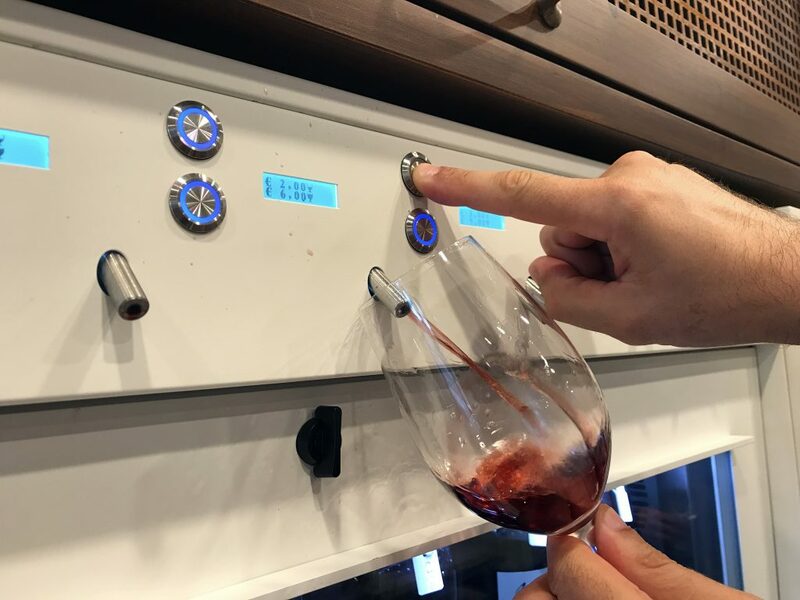 It’s an efficient way to taste a lot of wines, but you don’t get the experience of learning about the wines from an actual person. Prices ranged from about 2-10 Euros for a tasting size pour and about 8-20 Euros for a full glass pour. 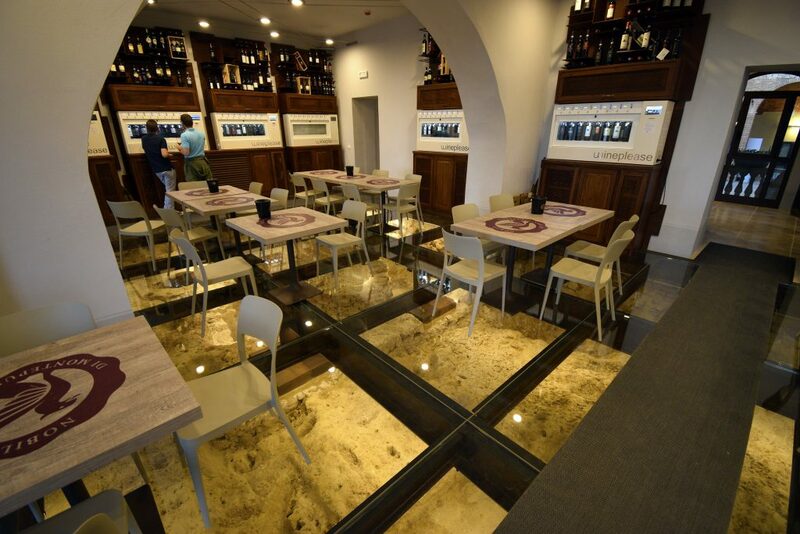 There is ample seating inside the shop over the glass floors. But for another great view, head out back to the terrace. 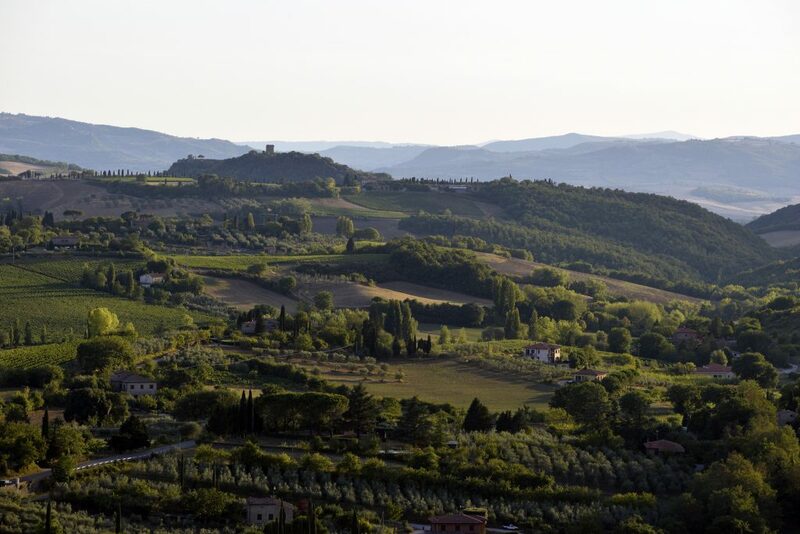 It has a beautiful view that looks out over the Tuscan countryside. 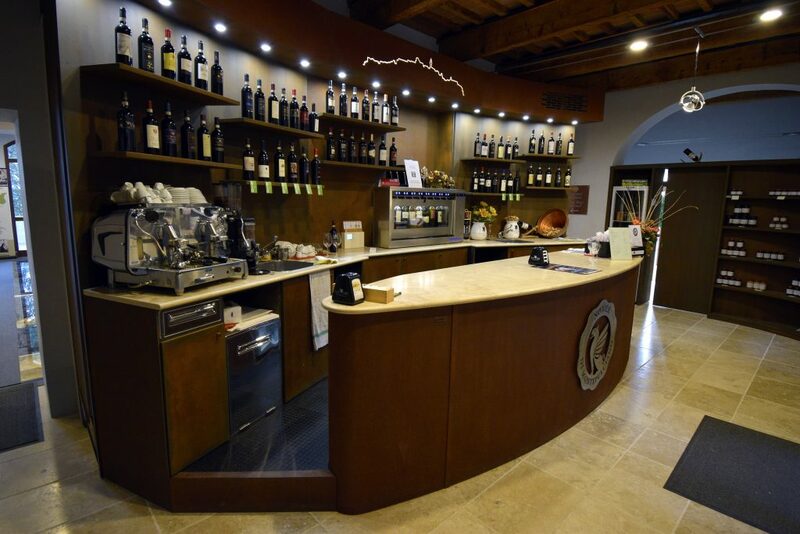 The Fortress of Montepulciano enoteca probably has the largest selection of wines in town. 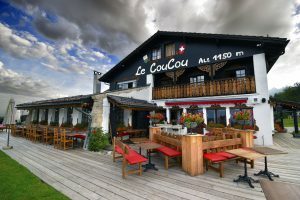 They carry about 100 different wines and you can taste all of them. They also sell them by the bottle if you want to take some home. If you want some snacks to go with your wine, try one of their salami or cheese plates. They also have a large selection of olive oils that you can taste as well. Don’t miss it for a one of a kind wine tasting experience in Montepulciano. They’re open Tuesday to Sunday from 11:00 am to 9:00 pm, and Monday from 11:00 am to 5:00 pm.